Posted by Alvgear in MMA on June 02, 2017 . 0 Comments. 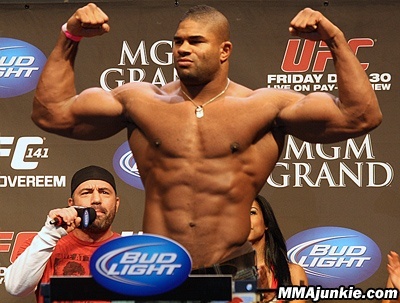 Former Ufc heavyweight Challenger Antonio Silva accepts that he used anabolic steroids for his fight against Vitaly Minakov.Antonio Silva weighed 285 pounds and look slower than former fights.We could not see lots of performance change since he is out of Ufc.He took some steroids and his body look bigger but that s all.At this point we must discuss some other things to know performance of this athlete clearly.He is in late 30’s ,he has lots of tough battles,injuries lots of training camps…If we will tell that there is no benefits of these drugs this is not true.We have lots of examples of former Ufc fighter and asian mma fighter’s performance Exchange years by years. If you are talking about trt most popular athlete is Vitor Belfort.He is a fan of these anabolic products.This weeken he will fighting last time.This is the end of his career.To be hones Kevin Gastelum beat him easily and mma fans thought that it was right time to retire.But he wanted to fight one more time on his crowd on Rio.And this will be against another veteran Nate Marquardt.After trt bann there was a clear performance decrease on Vitor Belfort.If we discuss this fight i could say styleweise this is not a bad fight to Vitor he must use his hands more and keep fight on the feet.